Mindful Design Consulting Newsletter (July 2010) San Diego In Need of Improvement. This is our July 2010 design newsletter. 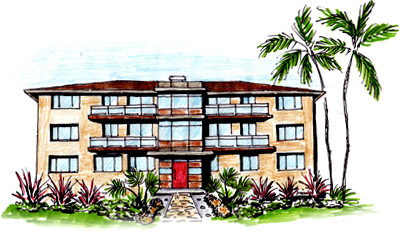 Today you will see my design ideas for a few San Diego waterfront properties. And now, you can post your reply to this letter on my new Blog. Have you felt the heat in San Diego this summer? In our Green News corner, I'd like to share a new invention - a wireless Solar Powered attic fan! It's quiet, it's easy to install and it's environmentally friendly! If you need to install an attic fan this summer follow the instructions provided in this article! No electrician is needed! How many of you would love to see some changes done to the building you live in or to the inside of your favorite coffee shop or a hair salon? There are a few businesses in town that grab my attention because of their bad design. 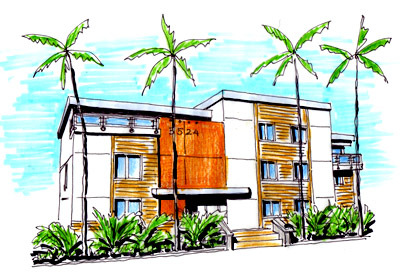 Today I present some of my design ideas for a couple of older condominium buildings that I would love to see renovated and improved. I will also share one project which was redesigned and finished thanks to one of my visionary clients from Metro Wealth! 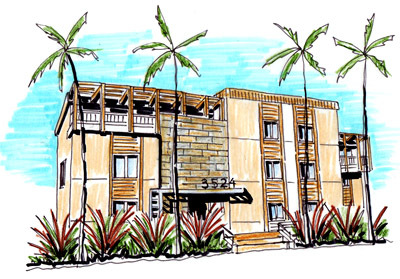 I've also decided to start posting design ideas for existing buildings and businesses around San Diego. Look for your business or a building next to you in this newsletter and let me know what you think HERE. San Diego is a beautiful city with a large amount of residential buildings which take advantage of the magnificent views from their ocean waterfront. However most of the residential buildings were built awhile ago and are starting to age under the effects of the salty air, wind, sun and over years of time. Let me know what you think about the area where you live HERE. The following are some of the waterfront properties I would love to see redone in the near future. It is truly up to us to make this city even more beautiful and to keep our properties at the highest value they can be. Riviera Terraces has a view of one of the bays in San Diego. The structure of the building is still in a good condition but the exterior (as well as interior) is lacking the beach character and feel which would go well in this area. All the finishes need to be upgraded to keep the integrity of the building and to prevent it from a further damage from the weather and aging. I propose two different options for this property. The first option has a more traditional feel and look to it with slate veneer accent and wood trellises over balconies. The trellises would extend livable spaces on the balconies for the occupants to enjoy in summer. I also propose to add some HardiPlank siding to accent the vertical lines of the structure. 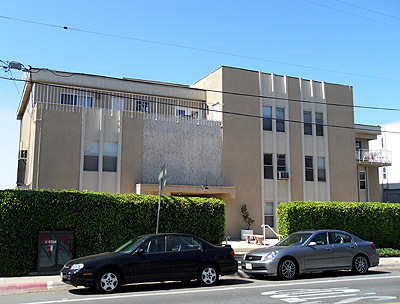 As a buffer from the street - drought resistant local plants would be added in front of the building. To see further design explanation for this option click HERE. 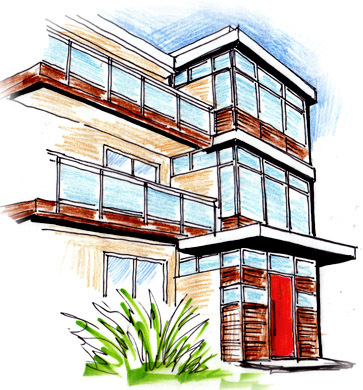 In the second, more contemporary option, I propose to add a distinctive bright color to the front entrance of the building and to change balcony railings into glass. Metal trim and glass would give an attractive contrast to stucco and HardiPlank in this design. To see more design description for this option click HERE. 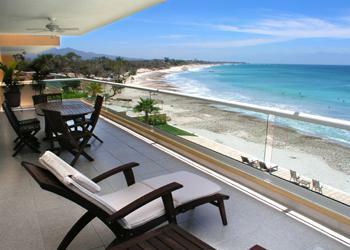 La Jolla Capri Aire is another property with magnificent views of the ocean. But the buildings have become simply a place for living, not a place to be proud of. 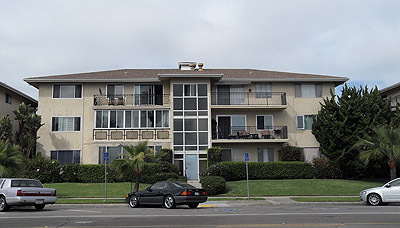 This development lacks a unique character and San Diego life style look, just as the previous building. 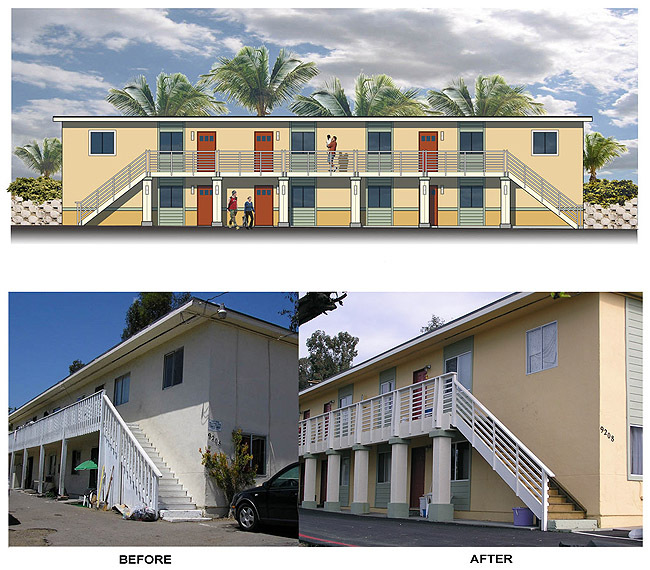 I would really like to see the ocean views taken into consideration in this property redesign. Adding some bright colors, contemporary weather resistive materials will give it character and bring up the value to these buildings. Local plants would also greatly complement this property and save San Diego valuable water resources which are being wasted on extensive sprinkling. I propose to redesign the finishes and the front entrances facing the water front to make them more attractive for the passers-by and to the community. Again, local drought resistant plants could be selected to make this property more economically sound on water. This property on Harness Street was recently redesigned by Mindful Design Consulting and remodeled by Metro Wealth. It doesn't take a lot of money to have a contemporary looking and attractive design. How to Install a Solar Attic Fan: Did you ever think of adding some kind of attic ventilation to your house to keep it cooler during the exhausting hot summer days or just to get rid of excessive humidity? There are quite a few solar powered attic fans on the market. 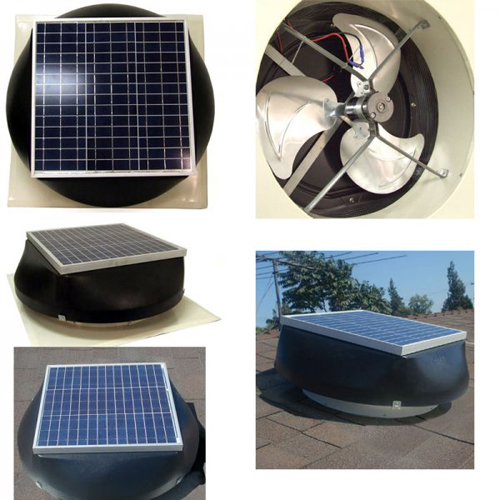 Your Solar Link now offers a new model of whisper quiet technology 20 inches in diameter blade (the largest blade on the market) Multi-Purpose Solar Attic Fans to ventilate attics and to keep your house cooler. See how to install it yourself HERE. 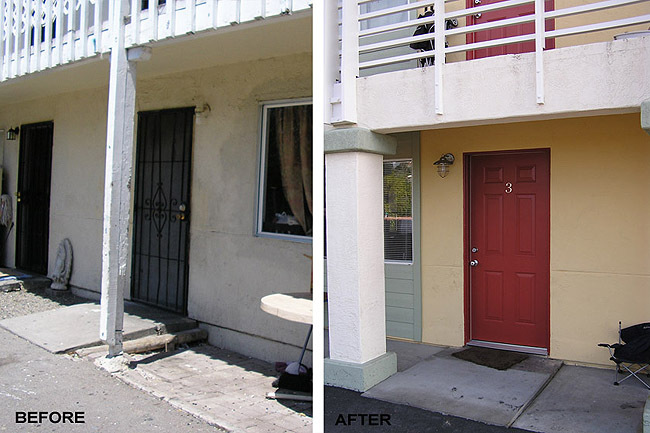 Ready for architectural changes of your property? Contact us HERE!